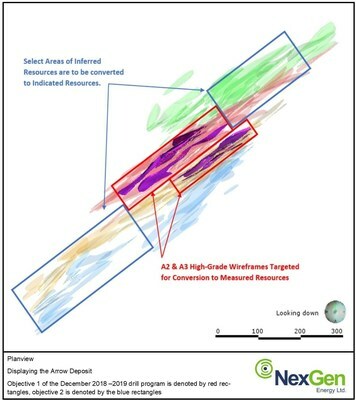 VANCOUVER, Jan. 21, 2019 /CNW/ - NexGen Energy Ltd. ("NexGen" or the "Company") (TSX: NXE, NYSE MKT: NXE) is pleased to announce that the largest drill program in the Company's history focused on optimizing mine development has begun at our 100% owned, Rook I property, in the Athabasca Basin, Saskatchewan. 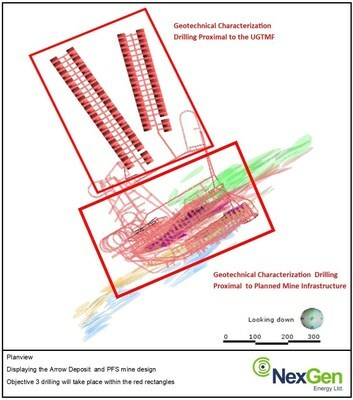 The drill program results will be incorporated into a NI43-101 Bankable Feasibility Study ("FS" or the "Study"), building on the successful outcomes highlighted in the Company's Pre-Feasibility Study ("PFS") (see News Release dated November 5, 2018) which demonstrated the Arrow Project to be an exceptional development opportunity for NexGen, Saskatchewan and Canada. Convert High Grade Indicated Mineral Resources to Measured Mineral Resources: Approximately 71,000 m will be drilled at a spacing sufficient to support the conversion of the currently defined high-grade ("HG") Indicated Resource (currently 256.6 M lbs of U3O8 contained in 2.89 M tonnes grading 4.03% U3O8) to Measured Resource. Measured Mineral Resources represent the highest level of mineral resource estimate, providing a significant amount of technical detail on the FS mine plan, design and economics. Geotechnical and Hydrogeological Characterization: Approximately 12,500 m of the 125,000 m will also incorporate the geotechnical and hydrogeological characterization of the rock mass in the areas of potential mine development and Underground Tailings Management Facility ("UGTMF"). This additional analysis will build upon the significant geotechnical, hydrogeological and metallurgical testing that has been incorporated into the PFS. Integrating innovative but proven mining, milling and environmental technologies and sustainable practices including the evaluation of alternative energy solutions to further increase NexGen's sustainability commitment. Leigh Curyer, President and Chief Executive Officer, commented: "This year's drill program will be the largest in the Company's history to date, and reportedly, in Canada for a uranium project in 2019. The team has focused considerable effort into the planning of the drill program and technical studies, which leverages our experience in optimizing mine development, processing and elite environmental management practices. With the opening this week of the new Saskatoon project office, which has been designed at a capacity to take NexGen through to reaching its objective of becoming a major producer of uranium on the world stage, it is very exciting times for the NexGen team and Saskatchewan." Troy Boisjoli, Vice-President, Operations and Project Development, commented: "The technical characteristics of the Arrow deposit has allowed for rapid growth and increased confidence through each successive drill program. This is an exciting time at NexGen, focussing on continued advancement of the Arrow deposit through the requisite development stages." For details of the Rook I Project including the quality assurance program and quality control measures applied and key assumptions, parameters and methods used to estimate the Mineral Resource please refer to the technical report entitled "Technical Report on the Preliminary Economic Assessment of the Arrow Deposit, Rook 1 Property, Province of Saskatchewan, Canada" dated effective September 1, 2017 (the "Rook 1 Technical Report") prepared by Jason J. Cox, P.Eng., David M. Robson, P.Eng., M.B.A., Mark B. Mathisen, C.P.G., David A. Ross M.Sc., P.Geo., Val Coetzee, M.Eng., Pr.Eng., and Mark Wittrup, M.Sc., P.Eng.,P.Geo. each of whom is a "qualified person" under NI 43-101. The Rook I Technical Report is available for review under the Company's profile on SEDAR at www.sedar.com. A technical report in respect of the PFS will be filed on SEDAR (www.sedar.com) and EDGAR (www.sec.gov/edgar.shtml) within 45 days from the date of the PFS news release (November 5th, 2018) providing details of the Rook I Project including the quality assurance program and quality control measures applied and key assumptions, parameters and methods used to estimate the Mineral Resource.